When Brandon was first diagnosed with autism, we weren't exactly sure where to start. We had done some research, but the conflicting information is overwhelming. Thankfully, we had Autism Tennessee to help light the way for us. We went to several workshops that helped us navigate this brand new world. 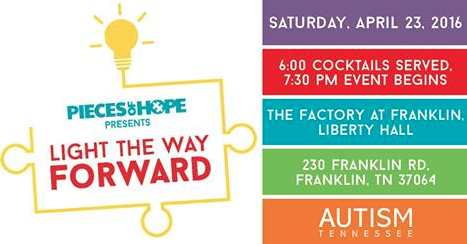 On April 23rd, Autism Tennessee is having their annual fundraiser. It's going to be a fun-filled evening with cocktails, dinner, and a live and silent auction! Click here for additional information. Can't make the event, but want to contribute? Click here to buy a raffle ticket! They are $25, and if you win you get to choose one of these three items. You do not need to be present to win!